Anolon SureGrip™ Bakeware is designed to make baking more efficient, safer and easier, while standing up to the rigors of serious baking. 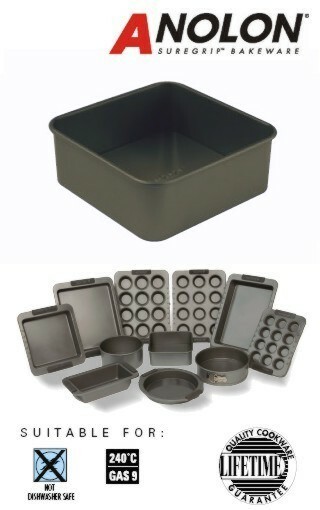 Anolon SureGrip™ Bakeware is constructed of 1mm carbon steel, which conducts heat better than stainless steel. It is ideal to use for all baking tasks. The handles are covered in silicone, which is oven safe up to 240°C, 475°F or Gas Mark 9 and is non-slip providing the cook with a secure grip, even when using oven gloves. For added convenience the bakeware has a dual layer non-stick coating inside and outside for easy food release and cleaning. Before use, wash in warm soapy water and dry thoroughly. For best results when baking, lightly grease before each use. Do not use in microwaves. Not suitable for use over direct heat or under grills. Always use an oven glove when removing from the oven. Do not use metal utensils or abrasive cleaners. After each use, wash in warm soapy water, rinse and dry thoroughly before storage. We recommend using Circulon 2 utensils to prolong the life of your Anolon bakeware.